In this article I am explaining the specifications and review of the new Samsung Galaxy Beam. Read more about the cool features of Android based device and know what are the pros and cons of this new smartphone. We have seen a number of new companies, approaching the market with new smartphones that has a good standard to offer. And now Samsung is coming with a fresh air of innovative idea called the new 'Samsung l8530 Galaxy Beam'. It can be called as the newest member to the Galaxy series till date. It is not just a smartphone that runs on Android like others, it is integrated with a projector. Yes, Samsung is doing it again. It was announced on February 2012. A couple of years ago Samsung released the 'Samsung l8520 Galaxy Beam', and now we can say Samsung is trying for and update to the old one with the release of the new 'Samsung l8530 Galaxy Beam'. It can only be considered as an upgrade in case of the projector only, in other cases Samsung has truly reduced the features. The new Beam is a bit taller than the previous one. The previous one was provided with a Super AMOLED display and now it has been reduced to regular 4" LCD screen. This reduction can also be seen in case of camera too. The predecessor was provided with a fully functional 8 megapixel camera, and here in the new Samsung Beam, the camera is reduced to 5 megapixels. But we can see an upgrade only in case of projector. The projector on the old Beam was of 10 lumen bulb, and in the new one the user gets a 15 lumen bulb, which is much worth than the change in the display and camera. The new Beam still need some touch-ups before it is marketed. While considering the internals of the new Samsung Galaxy Beam, the new one comes with an upgrade in CPU and RAM. The new Beam runs on two Cortex-A9 cores, which is clocked to 1Ghz and it has RAM of about 768Mb which is double than the predecessor. And the most important feature that makes the Beam a smartphone is that it runs on Android v2.3.6, Gingerbread, which is found in almost all smartphones. The Galaxy Beam runs on a much interactive user interference of Samsung called TouchwiZ 4.0. The new Samsung l8530 Galaxy Beam is powered with the latest Nova Thor U8500 which makes it run smooth, along with the 1Ghz processor and a lot of RAM. The new Samsung Galaxy Beam comes with a 4" WVGA display screen. The screen is TFT capacitive touchscreen supporting multitouch. As we said above, the Samsung Galaxy Beam comes with LCD type screen offering very natural and accurate colours with 16M colours and high colour density( 223 ppi ). Althouh the phone doesn't offer such bright display, it does well under sunlight and it does it more than our expectations. The screen is having a resolution of 480x800 pixels. 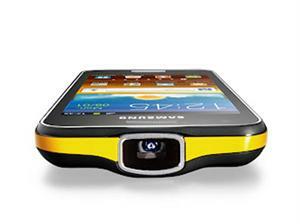 The Samsung Galaxy Beam is smartly designed with an in-built projector. It is provided with stylish orange band on the sides. It is more slim and tall than the predecessor. Althouh it looks a bit bulky on the look, Samsung has tried the maximum to gives that new in-hand experience. For that the team has included a tapered back, made patterned to make it non-slippery, by providing soft-touch plastic. The only thing that may feel may a bit annoying is the bulkiness above the small circular camera, where the 15 lumen bulb for the projector is placed.On examining, we can find a power/lock key on the right side and above it, there is a dedicated projector key, which can be operated any where from the device like, gallery, browser, documents etc. There is volume rocker on the left, which are good and easy to feel. On the front, below the display there is an elongated physical home button. The different ports and slots on the device is smartly covered with protective flaps due to protective reasons. The volume rocker included in the device performs mutiple tasks, like flash light control, focus the screen etc, which we will discuss in detail in this article. The projector on the device is the main highlight of it. first, thanks to the Samsung team to come forward with such an innovative idea. Although they have done it a couple of years ago, they are doing it again to make-up with the failures that they faced earlier. Now the Samsung Galaxy Beam comes with a projector, loaded with 15 lumen bulb, which is enough to produce standard projecting quality. It is a smart pico projector fitted smartly inside a smartphone. The company claims that the projector is able to give an output of 640x360 resolution, which offers a large screen as big as a 50" inch TV screen. The tests that we had done on the projector reveals that the projector does give decent output in both daylight and darkroom. And the best result was obtained in complete darkness projected on smooth white wall. Along with the decent output by the projector, the Beam team has improved it further by bringing in a new dedicated projector application. It can be wisely used to enhance and handle the projection or the presentation, the user is doing with it. In it there is a Quick Pad mode, in order to use a pointer or a pen to enhance or highlight the presentation. The default orientation of the screen is landscape mode. The also exist a dedicated projector key, to bring up the projector, whenever the user wants and it allows the user to project whatever it is on the 4" inch LCD screen. It can be videos, pictures, documents, presentations, browser etc. While in projection mode, the volume rocker functions as a controller which helps to focus the screen. Another interesting feature is that, the projector can also be used as a flash light. And that is an interesting feature that everyone now wants. Once in the flashlight mode, the volume rocker functions as the brightness controller for the light. Like the usual smartphones, the Beam has dual camera support. It has a rear shooter having 5 megapixels. It can capture picture of resolution up to 2592x1944 pixels, which is really good for a smartphone. The shooter is auto-focus enabled. It is associated with a single LED flash. It can also be used to capture videos of 720p @ 30fps. It also has a secondary camera on the front, which enables video calling and chatting. The secondary camera is of 1.3 megapixels. The shooters also have the features such as Geo-tagging, Touch-focus, Face and Smile detection etc which enhances the Camera experience. The Samsumg team has shown no shortage in case of the connectivity of the Galaxy Beam. It has 2G and 3G connectivity which is enough to make the device fast. It also supports GPRS and EDGE. In HSDPA it offers a speed of 14.4Mbps. It is also Wi-Fi enabled, with 802.11 b/g/n. It is facilitated with DLNA,and Wi-Fi hotspot. The Galaxy Beam comes with latest Bluetooth 3.0, which makes it fast in remote data transfer and offers a long range of connectivity. The bluetooth is enhanced with A2DP. It also has a microUSB port on the bottom of the device to extend the connectivity to a PC. Along with all these the device comes with accelerometer, gyrosensor, proximity sensor, and e-compass. It also supports java with MIDP Java Emulator. Samsung Galaxy Beam can be considered as one of the master pieces of the Samsung. They have come up with a much innovative idea and have successfully made it into reality. The main feature, which is the projector, is not much seen on other phones and it surely have increased the price. 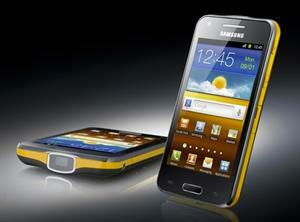 In India the Samsung Galaxy Beam will be available from Rs.35000 onwards. 1Although it is a much expensive gadget, it is worth of what we are paying. The company also offers a projection time of full 3hrs which is too good. The device is expected to be released in July 2012. The device is mainly for business purpose, but the company's approach is for the teenagers, but the faith will be decided soon after the release. All these features with the above mentioned projector, above average battery life, Android OS, pricing etc makes it a perfect smartphone. 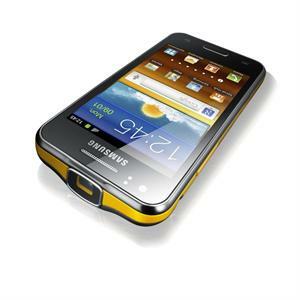 Samsung Galaxy Beam smart phone special features are added here. Samsung has been producing so many latest technology cell phones so far. Now, it releases Samsung Galaxy Beam smart phone which has special property of projecting. Buy Samsung Galaxy Y S5360 android smartphone through online shopping websites at best price offer in India. 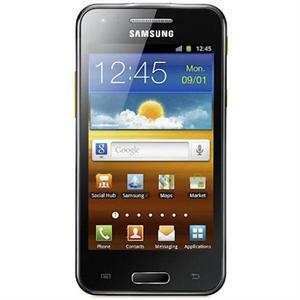 Samsung galaxy Y is available at various shopping websites for online buy. Being one of the fast selling budget android phones, the Galaxy Y is especially targeted at the young generation of India. The 'Y' which stands for 'Young' makes clear how the company has managed to produce a device keeping the young dynamic mobile users intact. A comparison of features and specifications, price of LG Optimus Vu 2 and Samsung Galaxy Note 2 in this article. LG, Samsung, Pantech upcoming smartphones have Full HD display. Read more about this upcoming Smartphones in the article. Samsung Beam smartphone has less feature, it works good for projector (with 15 lumen bulb). You will find its camera with 5 megapixels and has dual cameras.